S4 vs One: Fight! Fight! Fight! Have we witnessed a giant momentum shift in the battle for Android overlordship? 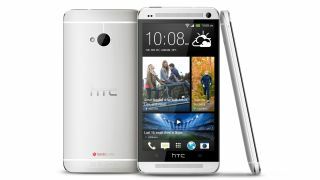 HTC seems to think so, after deriding Samsung's new flagship Galaxy S4 device, calling it a poor rival to the HTC One. Following Samsung's bewildering Broadway-inspired launch event in New York, HTC's Chief Marketing Officer Ben Ho couldn't wait to stick the knife in, claiming the company spent "more on marketing than innovation." In a statement sent out by HTC's PR agency, Ho claimed that the device was simply 'more of the same' from the current Android kingpin and accused Samsung of playing to the masses with its new handset. Ho said "With a continuation of a plastic body, and a larger screen being the most obvious physical change, Samsung's new Galaxy pales in comparison to the all-aluminum unibody HTC One." He continued to latch on to the contrasting design language between the S4 and the HTC One, something many critics and pundits have already suggested could help to tip the balance of power back to Taiwan. Ho added: "This is more of the same. HTC remains the best option for those people looking for the best technology wrapped in premium design. Our customers want something different from the mainstream, who appear to be the target for the Galaxy. "Our customers want original cutting-edge technology, mouth-watering design and a premium feel from their mobiles, which is why we created the HTC One." The fiesty comments from HTC come following a particularly interesting night on its official @HTC Twitter feed. The company spent much of the evening retweeting posts from users heavily criticising the S4 and favouring the HTC One handset. One tweet in particular from the account raised a few eyebrows: "So...how off-Broadway is this production? #theNextBigFlop #HTCOne." It does not appear that the company was hacked. Make no mistake, folks. After a couple of years in the doldrums HTC isn't about to go quietly into the night. Its faith in the HTC One handset, is backed up by early reviews and the war is most defiinitely back on.